1 of 3 Place wheat berries in a large bowl and add enough water to cover by 2 inches. Soak at room temperature overnight. 2 of 3 Drain wheat berries and transfer to a medium-size saucepan. Add 3 1/2 cups water. Bring to a boil, then reduce heat to medium and simmer for 45 minutes. Add a little more water, if needed, while cooking. 3 of 3 Drain and cool to room temperature. Meanwhile, in a large bowl, combine apple, dried fruit, celery, scallions and crumbled feta. In a small bowl, whisk together the vinegar, honey mustard, honey and salt and pepper. While whisking, add oil in a thin stream. 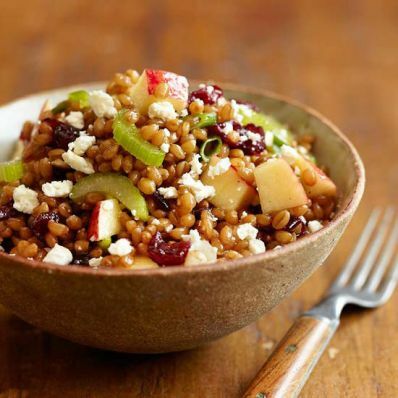 Add wheat berries and dressing to apple mixture in bowl. Toss gently and serve. Per Serving: 10 g pro., 418 kcal cal., 805 mg sodium, 7 g fiber, 4 g sat. fat, 17 mg chol., 15 g Fat, total, 60 g carb.